Home » Germany Will be Saved By the "Alternative"
Germany Will be Saved By the "Alternative"
On the eve of the most important regional elections in Germany - in Bavaria and Hesse - the leading opposition national-conservative party “Alternative for Germany” (AfD), which, according to polls, has become the second most popular in the country after the CDU / CSU bloc and the first in the former GDR, was able to get rid of the slander, which prevented her from achieving even greater success. The most important and completely unfounded claim of the German establishment against this young party is the accusation of its members and leadership of anti-Semitism. With the creation of the inner-party group "Jews in AfD" on October 7 in Wiesbaden, this defamation has ceased to be any convincing. Jews used to vote for this party - “anti-Semites” and “fascists”. Since they see AfD as the only political force that can really protect them in a country where being a Jew - due to the massive influx of migrants from Muslim countries - it becomes unsafe, and there is no longer any strength or desire to collect suitcases in search of a new homeland. Now it is just their party. While others protect the Jews only in words, ignoring the usually ugly behavior of the "refugees" who intend to make German Jews pay in full for all the real and imagined sins of Israel in the Middle East. Old and new anti-Semitism. What is more dangerous? Simple Jews and Germans are well aware that the old, almost non-existent type of anti-Semitism is not dangerous. But they are extremely concerned that the German leaders and the “progressive public” —with the leadership of many Jewish community and humanitarian structures tied financially to the globalists — point out that they do not want to see the terrible anti-Semitism of the “refugees” and the threat of Islamization of the country coming from them. And since the German majority, crushed by “guilt feelings” for the Nazi crimes of the past, weakly resists the supranational elite’s suicidal migration policy for Germany and Europe, it is the Russian Germans and Jews who are in the vanguard of the struggle for the true interests of Germany.The politicians who spoke at the event convincingly exposed the false lies about anti-Semitism of AfD, which appeared due to the phrases of representatives of the party taken out of context and the activities of several provocateurs. These "non-politically correct" descendants of those who were victims of mass executions and hounded in gas chambers, the descendants of those who were exiled to the labor army, who suffered so much from Hitler and Stalin, are people today fighting not only for their own and German interests. They are also ready to defend democratic Germany - and Europe. Europe, into which the globalists are launching in huge numbers of “refugees” from Islamic countries, in order to be turned into a police state in a while. What does the Jewish platform at AfD want? Therefore, the press conference of 24 Jewish politicians who announced the creation of a “Jewish platform” in the “Nazi” AfD, which took place in the capital of Hesse Wiesbaden, caused a real sensation. Fifty journalists from Germany, Israel, the USA and other countries attended this carefully guarded event. The anti-Semitism in Germany by the “refugees” from Arab countries was discussed in detail by the young politician Vera Kosova, a native of Uzbekistan, who chairs the board of the Jewish platform at AfD. She stressed that “immigrants from the Soviet Union play a large role in the Jewish community of Germany” and that “four board members speak Russian fluently,” despite the fact that it consists of seven people. Thus, the natives of the USSR in the leadership of "Jews in AfD" constitute the majority. Deputy Chairman of the Board Artur Abramovich, a native of Kharkov and a graduate of the University of Freiburg, very cleverly stopped the attempt to attribute AfD to the pro-Russian orientation, saying that some of the German Jews who support the party come from Ukraine, and that says it all. This event, of course, provoked harsh criticism from the rich part of the Jewish community of Germany, tied to serving globalist policies. If you live in a wealthy area, and do not share the same landing with Muslims, there is no reason for discontent. If your children do not go to a public school, where they are constantly humiliated by the Muslim majority, beaten, or even arrange symbolic executions, and they attend an expensive private school where discipline is maintained, then you can’t overlook strong anti-Semitism in Germany. Well, except to read in the newspaper, that somewhere there was a demonstration in support of the Palestinians under the slogan "Jews in the Furnace", that a rabbi was stabbed in the stomach with a knife, and an orthodox Jew, who dared to appear on the street in his particular dress, was beaten by Muslim youth. But the problem here is not that these people do not see what everyone else sees, but that they are too committed by the interests of the Jewish leaders tied to globalism and committed to the corresponding ideology. Therefore, Dalia Greenfeld, who heads the Union of Jewish Students in Germany, demands not to recognize AfD as a “friendly party”. And the vice-chairman of the CDU / CSU faction in the Bundestag, Stefan Harbart, calls the AfD actions “hypocrisy” and accuses the party of saying “it speaks too little about the crimes of the National Socialists”. This is not surprising, since AfD positions itself as a “true CDU” and constantly discourages voters from the party of “refugee chancellor” Angela Merkel. 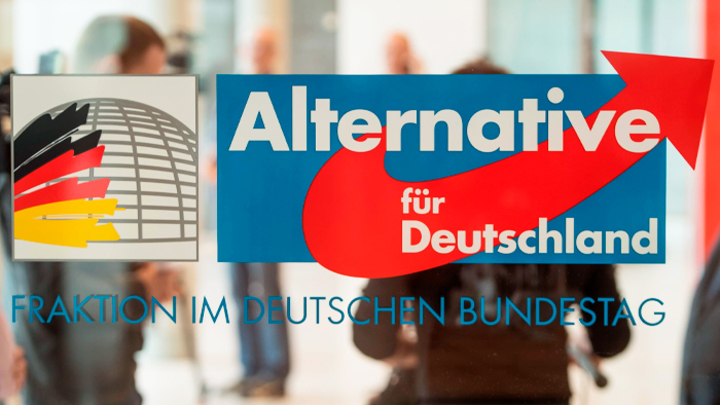 A total of 17 Jewish organizations, including the Central Council of Jews in Germany, still consider AfD to be a “racist” and “anti-Semitic” party. Thus, the former head of the Jewish community of Germany, Charlotte Knobloch, who survived the “Crystal Night” as a child, is perplexed in an interview with the Bild newspaper about how “Jews can somehow justify their membership in this party”. And all because AfD encourages the Germans to take a closer look around them. However, these and other high-ranking representatives of the Jewish community, including prominent journalists, are hardly right that the Jews will not vote for AfD. First, they are already voting, and very actively, despite the prohibitions of their community leadership. Secondly, they will now vote even more. Because these Jews live in the real world, walk along the streets of ordinary districts and constantly face a threat that for the wealthy Jewish elite seems not so obvious. Ordinary Jews do not know the true reasons why millions of incapable and violent migrants from Muslim countries are launching to Germany and Europe as a whole, but they know very well who will be their first victims. Not the Germans, the French and the British, but they. In fact, before our eyes, the tragedy of European Jewry during the Second World War is repeated, although not in such a dramatic form. By the way, the right-wing conservatives ’blamed accusations of anti-Semitism are characteristic not only of Germany. Marine Le Pen, the leader of the National Union (the party that bore the name National Front until June 2018) is accused of the same thing in France. The same lie applies to the leader of the Dutch right-wing Freedom Party Gert Wilders, a great patriot of both Holland and Israel. The rights of Jews and all indigenous Austrians to their homeland against Islamization are defended by the right-wing Austrian Freedom Party (FPA), Heinz-Christian Strache. It is sometimes still called neo-Nazi, because after the creation at the end of World War II, it was difficult to find an Austrian who was not a member of the NSDAP. Another malicious European “anti-Semite” is Hungarian Prime Minister Viktor Orban, leading an uncompromising struggle to preserve the identity of his country and Europe, in which Jews have lived for several thousand years. The same values ​​are shared by the Swedish Democrats, the Belgian party, the Flemish Interest, and the Italian League, which has become the ruling party, advocating the same values. Therefore, the future of Europe, including its Jewish population, depends on the end of the struggle between the “politically correct” projectors of the new world order and the “politically incorrect” realists who see what is happening in their true light.